OptiMind Reviews - Is It Worth Your Money? OptiMind Reviews – Is It Worth Your Money? Inability to focus, retain memory, or brain fatigue can make you less productive and successive in your daily activities. This can be caused by various factors including high-stress level and poor brain nutrition. You might want to consider nootropic supplements, to improve your cognitive function and brain health. OptiMind is a nootropic supplement that is designed to improve your cognitive function and mental performance. It claims to boost your mental energy and focus level. It promises to improve your energy level and attention. This product is formulated from 12 key ingredients that work together to promote your mental health and performance. It nourishes your brain with essential nutrients. It provides it with vitamins for improved energy levels and productivity. For optimal results, you are recommended to start with 1-2 capsules with a full glass of water in the morning. This will help you to gain tolerance after which you can increase the dosage to 2-4 capsules depending on your body type and level of tolerance. You are warned not to exceed 8 capsules within 24 hours. It is available on the brand’s website at a cost of $43.31 for a monthly supply. The manufacturer provides you with a free trial product. It allows you to test the safety and effectiveness of this supplement without incurring any cost. The manufacturer of OptiMind is AlternaScript LLC. The manufacturer claims that they first created this product for themselves before deciding to take it to the market. They are willing to take the loss in case you are satisfied with their product. They claim that they produce it from world’s best nootropic ingredients. They claim that it delivers its benefits within a few hours after consuming it and over time. L-Tyrosine – It is an amino acid obtained from seaweed and helps in the production of L-DOPA neurotransmitter, which is then used in the production of adrenaline, dopamine, and norepinephrine. Taurine – Helps to reduce stress and promote the formation of long-term memory. Bacopa Extract – It is rich in Bacoside A, which helps to improve your learning rates, cognitive function, and memory. Huperzine Serrata Extract – Helps in improving your cognitive functions and attention span. Phosphatidylserine – It occurs naturally in soybeans and helps in the efficient functioning of your brain cells. Caffeine – It is extracted from green tea and helps to improve your focus, energy, and alertness. Vinpocetine – It is extracted from periwinkle and helps to protect your brain cells from damage as well as improves your overall brain function. Alpha-Lipoic Acid – Helps to improve your focus level and reduces memory fog. Gamma-Aminobutyric Acid (GABA) – Helps to control your anxiety and stress level and boosts your focus level as well. Vitamin B12 – It is also known as cobalamin and helps to improve your energy level as well as regulate normal brain and body processes. What are the Pros of OptiMind? It may help to improve your energy. It enhances your focus level. What are the Cons of OptiMind? It is not suitable for children under the age of 18 years, nursing mothers and pregnant women. This product is designed for all individuals in need of boosting their mental energy and focus level. It is ideal for those in need of improving their mental performance and awareness level. Currently, students, athletes, entrepreneurs, and business executives are using it. 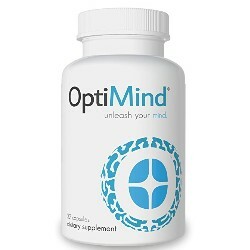 OptiMind is a nootropic supplement that claims to use the most potent ingredients to improve your mental performance. It may enhance your cognition functions and increases your energy levels. It allows you to focus and boost your learning rate. If you want to improve your achievements, success, and productivity, you might want to consider OptiMind and the results might surprise you as well. However, it is important to carry out more research on this product especially its ingredients. This will help you to ascertain for the safety and effectiveness of the ingredients used. You can compare it with other products to ensure that it is the right product for you. You can consult a certified specialist on this product and any other supplement in case of any concern. Also, views from other customers who have used this product may also give you an insight of what to expect from it.